If you are on this post, it means you are interested in creating a real estate website using WordPress. By default, WordPress has nothing special for WordPress related websites. But available themes and plugins can make this WordPress an ideal platform for real estate websites. In this post, I am listing best real estate WordPress themes. These themes come with option for property submission, custom fields for property, location maps, gallery, property documents uploader, search forms and many other things. Select the theme which suits you and start your next real estate project. 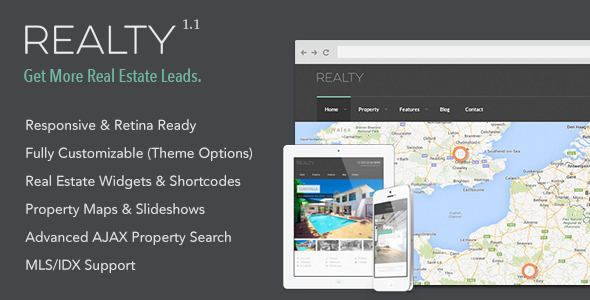 Realty Real Estate WordPress Theme is built on Bootstrap 3 and comes with responsive layout. It works perfect on all kind of screen sizes. It is built by taking care of all SEO rules. It is also integrated with Google Maps. So, it will show the location of the property on maps. This theme is best for real estate agency. With this affordable theme, you will have a working property website quickly. WP Pro Real Estate 6 is one of the popular real estate WordPress themes. Purpose of the theme is to showcase property listing in better way. It comes with built in page builder, skin changer, custom backgrounds and retina display support. Theme is SEO optimized and supports Google fonts. vEstate is a flexible WordPress real estate theme for agents and real estate companies. It comes with HTML5 and CSS3 design and offers responsive layout. 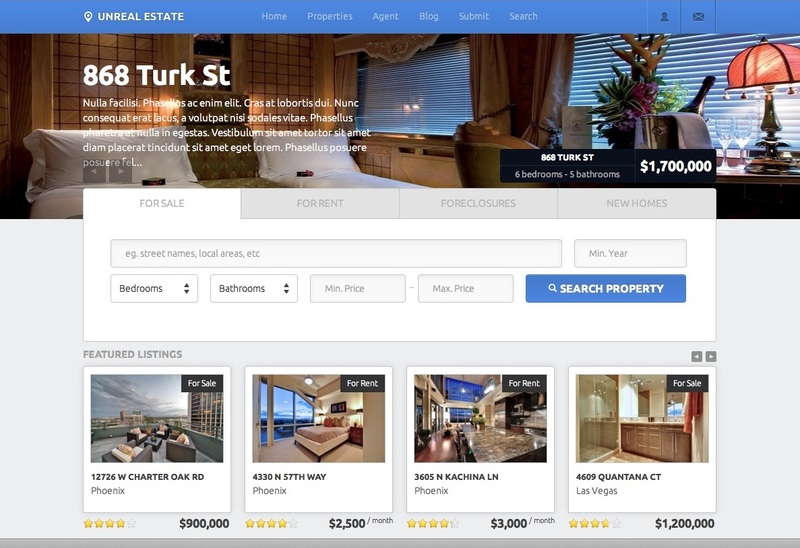 Advance search page lets users search property in better way with available filters. It is Woo-commerce ready and comes with 5 step checkout process. Unreal Estate is a clean, real estate theme with modern responsive design. The theme is built on Bootstrap design framework and works fine on mobile devices too. It offers three kind of property listing view, advance property listing search page, Google maps integration and agent profiles. It also comes with sample property data. Sweethome is also a good responsive WordPress real estate theme. It comes with powerful admin panel and woo-commerce integration. It is also a translation ready, so you can create property website in any language. Estate Plus is also a nice WordPress theme for real estate portal. It comes with powerful page builder, front end property listing form, dslDXpress plugin, mega menu and responsive layout. It also supports Google fonts and font awesome icons. Custom gallery page lets you create property gallery. WP Residence is designed for Real Estate agents. With this theme, they can easily build their property listing website. It also comes with options to create subscription packages. You can create your own custom property fields, search filters and powerful ajaz searcg. It also lets you show property listing in sliders and Google Maps.